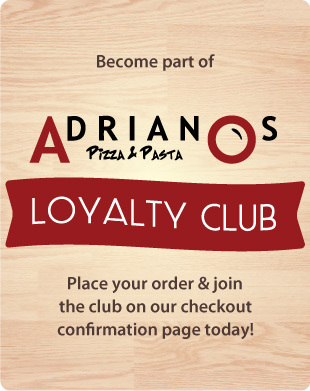 I have ordered from Adriano's before and will continue to do so. The service is excellent, the food is always fresh and the staff are always friendly and curtious. I do suggest that when ordering on line it's best to get in early especially later in the week as sometimes it's a 75+ hour wait.. Tried the spud meals fantastic would recommend Jeff. As always, sooooo good. My new catch phrase for Adriano's Pizza & Pasta is "Yumminess in a Box"!